Is your business leading or lagging on social in your industry? Without competitive benchmarks, it’s impossible to tell. And if it’s possible to tell what’s working and what isn’t, why commit to a social media marketing strategy in the first place? Our latest research puts an end to that existential crisis. We analyzed the social media content from over 40,000 companies across 130 major industries on four major social networks —Facebook, Twitter, Instagram, and LinkedIn — to provide businesses with relevant benchmarks for social media audience size, posting frequency, and engagement at an industry-specific level. The findings, summarized in our 2016 Social Media Industry Index, point to drastic disparities in social media marketing strategy across networks and industry verticals. The engagement ratio per brand — or average interactions per post per brand per 1,000 followers — decreased on Instagram (by 25.85%), Facebook (by 8.27%), and LinkedIn (by 7.6%). On Twitter, the engagement ratio per brand increased slightly, up 1.08% across the first half of 2016. 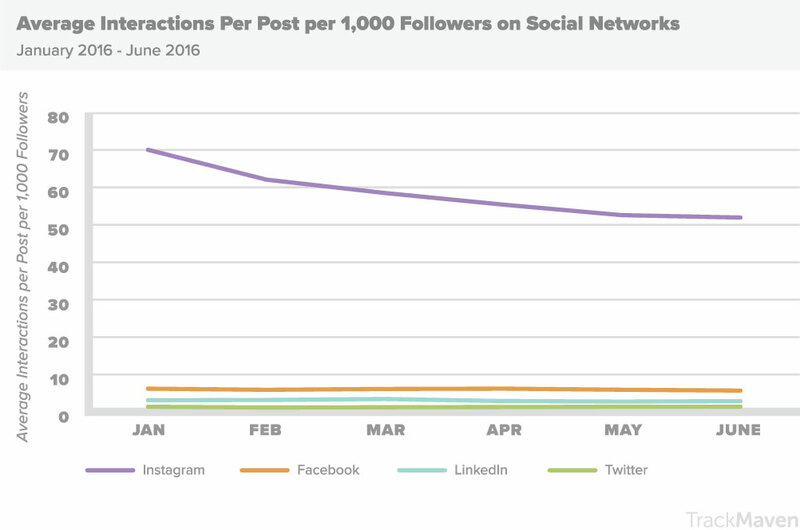 Brands see the highest average engagement ratio on Instagram. However, as Instagram made major moves towards monetization across the first half of 2016, including the introduction of a ranking algorithm and and business profiles, its engagement ratio fell by 25.85%. Across all 130 industries analyzed, the Music industry leads the engagement contest on Twitter with an average of 1,745 interactions (likes and retweets) per tweet. The boy band One Direction, for example, averages 68,960 interactions per tweet. On Instagram, the music industry beats all 129 other industries with an average of 58,546 interactions (likes and comments) per post. Businesses in these two industries rank in the top 10 on Facebook by average number of followers, average number of posts per month, and average interactions per post. Interactions include likes, shares, comments, and reactions. Put differently, Sports and Entertainment brands post frequently, see high levels of engagement, and attract large audiences on Facebook — all signs of highly effective Facebook content. The Wine & Spirits, Luxury Goods & Jewelry, and Airlines/Aviation industries have the highest average interactions per post on LinkedIn. 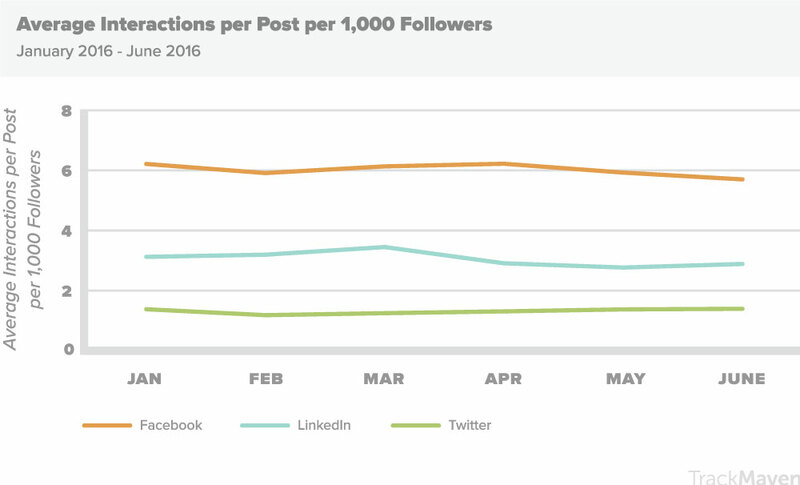 This finding stands in contrast to the industry with the highest average followers on LinkedIn: Pharmaceuticals. Diageo, the parent company to liquor brands including Guinness, Smirnoff, Johnnie Walker, and Tanqueray, leads the wine and spirits industry on LinkedIn by engagement. Louis Vuitton leads by engagement on LinkedIn in the Luxury Goods & Jewelry industry. Emirates leads by engagement on LinkedIn in the Airlines/Aviation industry. Find out how you measure up against the rest of your industry. 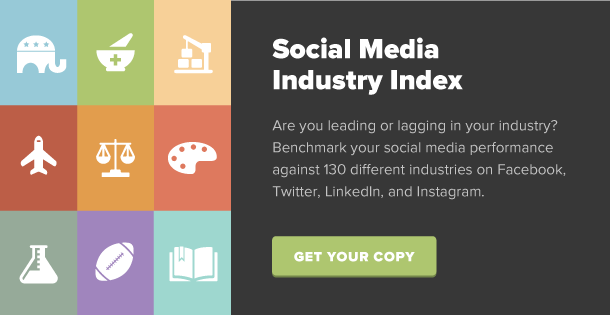 Download your free copy of the 2016 Social Media Industry Index!